well I have made the New Years resolution to my amazing partner that 2019 will be guitar free (didnt promise amps lol) but I had a spurt in the last week. I got a cool looking black with white PG squire for $50 oz which isnt even a bottle of bourbon..it is in new condition with a hardcase!!! i could easily flip for $200 without even trying but I also bought a flash (swear word around here) twanger 8 string guitar lol. I got an Ibanez Prestige for a steal with polar burl and birdseye maple neck and sd custom pickups. I thought if i was ever going to get a guitar to match my amazing basses i better get a bloody awesome one!! I am sick of mucking with cheap rubbish. and a 27" scale and bottom string being .80 it isn't that far off bass anyway lol. This year I bought my dream bass a 94 NT6 thumb that was beyond my dreams as far as how much I love owning it. I also bought a brand new Spector LX5 that is the most beautiful looking bass that I have ever owned and love so much. I consolidated my pedal love with a darkglass AOU and got a Carvin B2000 that I am going to get rid of and upgrade to a big tube amp hopefully ashdown. I have also done a very cool fretless conversiion and full EMG upgrade on my Spector Legend 6 which i am still ironing out and will talk about when done. 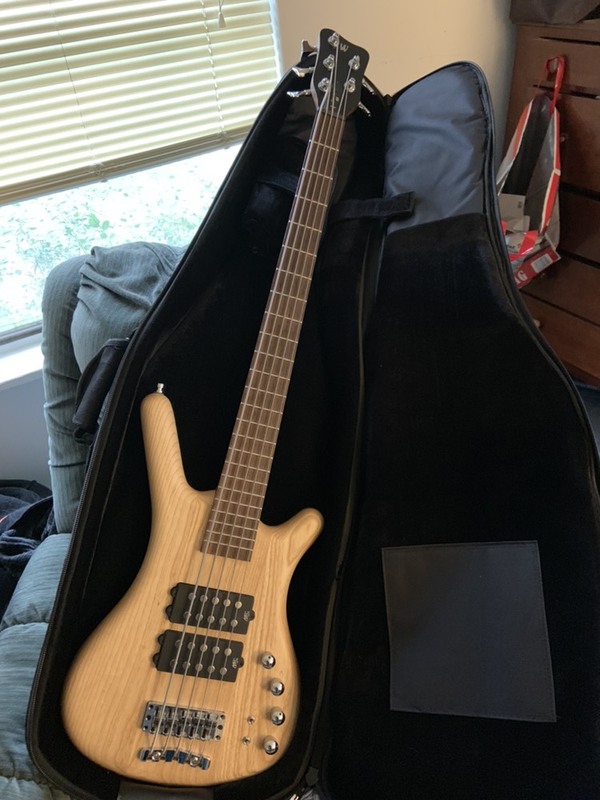 I also have upgraded my very first bass that has been sitting in the cupboard for 8 years without love an play and got an EMG PJ set off of ebay in USA for a steal and I am also upgrading all the hardware on it to black it out. Suffice to say I have spent alot of my money on gear this year.. judge of that what you will but I will say that having bass playing as a main focus in my life at the moment has been a HUGE thing. I have been through some of the worst trauma a parent can go through, have moved to an extremely remote place and started the most challenging job in my life. I would like to extend my love and gratitude to the Bass-Arena/ Warwick forum community and I just want to say you will never know how much it means to me to talk about my passion with people that get it and we are connected no matter how far we are apart by a love for something we find special in this world and that is a great thing. Dazed, Rehan, PaulS and 5 others like this. Yeah the guy who makes them said I was the third one he has made and sent to New Zealand. Such a lovely sounding preamp. I can see why they don't come up second hand. Il be keeping mine for sure. This arrived today. Sounds and feels really nice, really happy. tomb68, Hardy, jester and 4 others like this. I've been looking for a fretless 5 that will sound nothing like my Pedulla Buzz, and this will definitely work! Mahogany body with Maple top. Mahogany neck and Birdseye Maple fingerboard. Nordstrand P pickup under matching pickup cover with piezo bridge. Should be here in a week or so...! Rehan, Florin, tomb68 and 6 others like this. This is nuts on so many levels. Is the P coil setup traditional or reverse? Honestly, I'm not sure yet! I'll hopefully have it next week and will give it a good examination when it arrives. It's chambered (hence the light weight) and has a nice thump with the piezos. I am super excited to get it, and it didn't even occur to me to ask about the coil configuration. It'll be weird not having lines, but it's got the luminlay position markers, so it'll actually be more useful in our dimly lit practice space. It's chambered (hence the light weight) and has a nice thump with the piezos. Ah, that explains it. One of the nuts factors was the single magnetic pickup so far from the bridge. I'm almost certain the P will be reverse ("logical"). naetog, Hardy and Stainless like this. Incoming: Warwick 2017 pro series Corvette $$ 5 in natural. Curiosity got the better of me since I haven't played a newer Warwick (post 2005-ish). RIP, Hardy, Hoggles and 1 other person like this. Very nice, congrats! You should be happy with what you're about to experience. That exact same desire overcame me a few months ago, when I picked up the '15 SSI. Stoked I did. Let us know what you think when it comes in! Rehan, tomb68 and Hardy like this. RIP, Stainless, naetog and 4 others like this. Rehan and RIP like this. This is a serious temptation to me. Do you have to route for new controls or can it be done in a stacked configuration with the existing pot configuration? I can hopefully tell you tomorrow. The bridge I got is out of a Thumb BO and has three stacked pots (1x volume+balance+push/pull, 1x bass/trebble, 1xpiezo+?). My Fortress has four pots. I have to check how big the board is, to see if everything will fit. What should work is to just use these three pots and leave the forth one for space for the board. Totally. Maybe. How much would that much brass cost? Does Warwick make a brass JAN for those? OK, it's here and I"m really impressed. I CAN tell a slight difference between it and my 2004 $$ but it's only slight and I'm pretty thrilled. RIP, Bassist4Eris, jester and 1 other person like this. Do you have to route for new controls or can it be done in a stacked configuration with the existing pot configuration? Stainless and tomb68 like this.